I tried to calibrate the ESC, I plugged the battery when it ask, the front 2 motor start spinning with out stopping until I removed the battery. Set the parameter SYS_USE_IO to zero or "Disabled"
Using the 2nd solution also reduces the delay in the control loop but disables the I/O co-processor (not really needed on a quad). Having the motors spinning at idle speed while being armed and at zero throttle is the expected behavior. If you truly want to have the motors stopped when armed and at zero throttle, you can set the PWM_MIN parameter to a low value and MPC_THR_MIN to zero. To avoid uncontrolled free fall during flight, you should then enable airmode (MC_AIRMODE) and make sure that the pwm min value is really close to the motor starting value and that you have good ESCs that can quickly restart, even if the rotor is already spinning. I'm not sure if I understand correctly. When you say "the flight mode", which mode is it? Stabilised? Position? Do you have mag inconsistent warning before or during flight? Could you maybe share a log and a few pictures of the setup? @Mohamad_Hariri Hi, thanks for the picture and the log. However I can't access your drive. Could you upload the log file(s) to https://logs.px4.io/ and share the link here? Did you do a compass calibration (followed by a reboot) on the complete setup? Does the heading drift in the QGC compass display? one more question if i want to connect a servo to the drone, do i have to connect it to FMU on the power board? is there any setting i have to do ? The mag problem is king of weird. I'll think about it. About the servo, you can connect a servo to the output 5 or/and 6 of IO. The mixer already support it: https://github.com/PX4/Firmware/blob/master/ROMFS/px4fmu_common/mixers/quad_x.main.mix and https://dev.px4.io/en/concept/mixing.html (use AUX1/2). I am planning to use the same ESC motor combo you have used. I wanted to get your feedback regarding the performance of the system before I ordered the components. Are you using 800 kV motors ? What are your battery specs ? I read your first reply. I have several questions. Can I use FMU port instead of I/O port of the PDB to receive signal from FC without setting up any other parameters? IO is used to have more PWM ports and to be able to recover manually a plane if FMU crashes. For a hex, it's totally reasonable to disable IO if you don't need additional outputs. 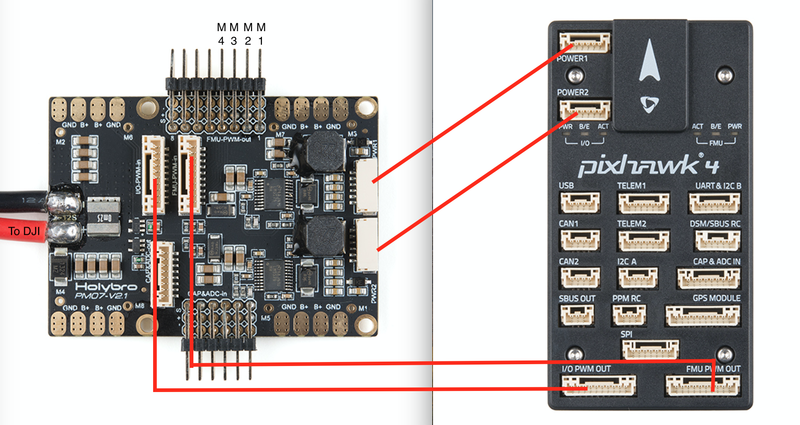 As an example, the PixRacer autopilot has no IO processor and it's perfectly fine. I wanted to know if PWR 2 is required ? According to the documentation I can use just one power brick of Pixhawk 4. 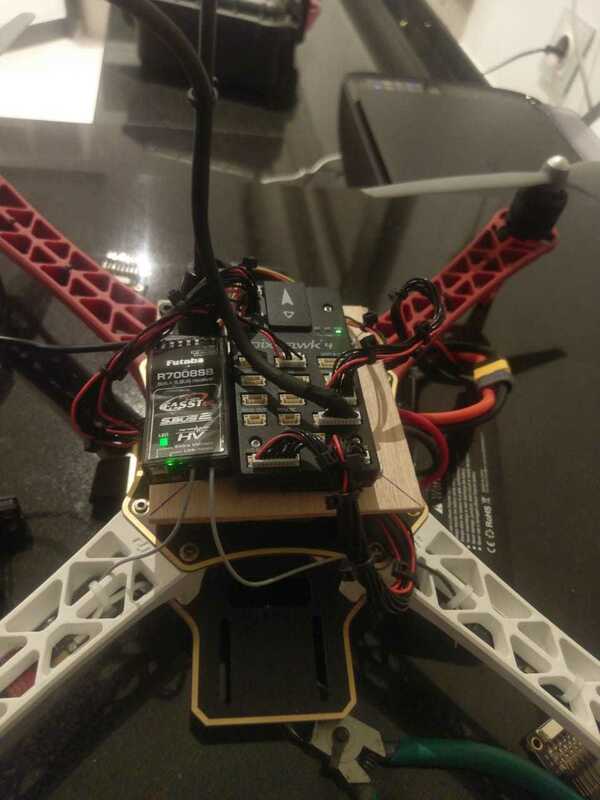 Additionally I will connect the ESC signal wires to the M pads on PDB (of Pixhawk 4) as discussed in this post. However then, are the connections to I/O PWM IN and FMU PWM IN at PDB required ? Thank you for helping me on this, this post is very useful ! PWR 2 is useful if PWR 1 dies, it's really rare and it's up to you to decide if your autopilot needs power redundancy (it never hurts but it's not mandatory).